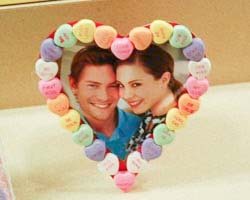 These conversation heart frames are a fun and easy way to decorate for Valentine's Day. 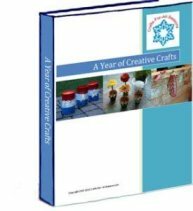 This is a perfect gift to give to your significant other, because it is hand made! 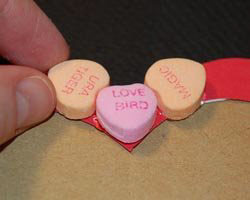 To make the gift really personal, hand pick the heart candies with the sayings that are most appropriate for your relationship. Put your favorite photo of the two of you and you have a perfect Valentine's Day gift idea! These are easy to make and look really pretty, and all the instructions and pattern are below. 1. Begin the conversation heart frames by clicking here for the patterns to print out. A new window will open, and you can print out the PDF file (Adobe Reader is required). 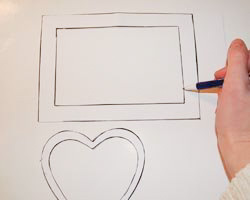 After printing out the templates, cut out the pattern of choice, either the rectangle (which will hold a 4x6 photo) or the heart frame (in which you will have to crop a photo to fit). Do not cut out the inside of the frames (yet). 2. 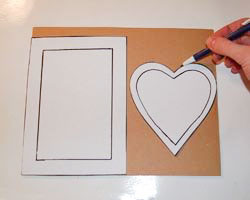 Place these cut patterns on top of the cardboard, and trace around the outside of the patterns with a pen. Carefully cut out the shape from the cardboard. 3. Next, cut out the inside of the frames from the pattern you printed out. 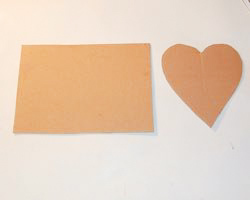 Place this cut template on top of another piece of cardboard. In the photos below, this second piece of cardboard was white. Trace around the pattern and then carefully cut this out of the cardboard. 4. 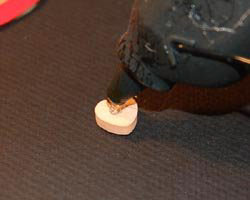 Apply glue around the edges of the frame backing, all except the top edge (as shown). Then, secure the frame to the frame backing and allow to dry. Clamp with some paper clips (optional). 5. 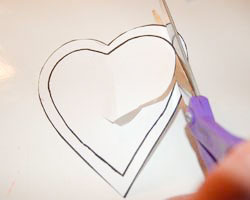 Use the cut out patterns to also cut out a frame shape from the card stock (either red, pink, or white looks best). 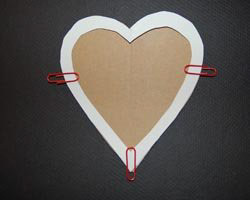 Use glue to secure this card stock over the cardboard frame. This is done because some of the cardboard frame will be visible between the candy hearts. 6. 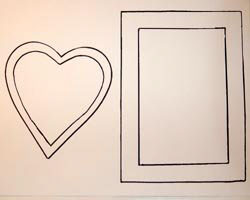 If you want to add ribbon, which I think looks good on the rectangle frames, do this before you add the hearts. 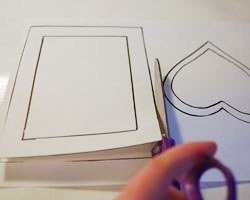 Attach a length of ribbon to the outer edge of the frame, using white glue. Allow to dry. 7. 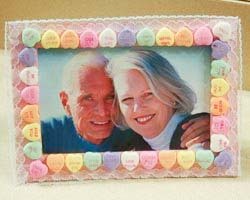 Begin gluing the conversation candy hearts to the frame, one by one. 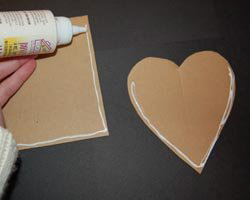 Add the hot glue to the back of the heart, then place on the frame. Follow the photos below for placement suggestions. 8. 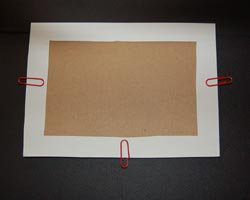 To make the frames stand, cut out a rectangular piece of cardboard, and glue the top end of it to the back of the frame, using the other end as support on the table.